The aim of the study is extraction of phenolic compounds from cranberry bush (Viburnum opulus L.) fruit using ultrasonic bath at 50 0C. High amount of phenolic compounds which is included in the cranberry bush fruit, are easily deteriorated because of theirs sensible structure. For this reason novel technologies that will fewest harm to phenolic compounds are growing importance. At the study, extraction operation is carried out by water using three different solid:solvent ratio (5:100, 10:100, 15:100) and six different process times (1 min, 10 min, 20 min, 30 min, 60 min, 120 min). Total phenolic contents, antioxidant capacity and color values were determined. The optimum solid solvent ratio and optimum extraction time according to the total phenolic compund values found as 5:100 and 60 minute, respectively. On the other hand L*, a*, b* and total color change values showed a highly possitive correlation with total phenolic contents. Bu çalışmanın amacı gilaburu (Viburnum opulus L.) meyvesinden fenolik bileşiklerin ultrason destekli ekstraksiyon sistemi ile elde edilmesidir. Gilaburu meyvesinde bulunan yüksek miktardaki fenolik bileşikler, hassas yapıları nedeniyle kolayca bozulabilmektedirler. Bu nedenle, ekstraksiyon yöntemi olarak fenolik bileşiklere en az düzeyde zarar verecek yenilikçi teknolojiler önem kazanmaktadır. Çalışmada, üç farklı katı:solvent oranı (5:100, 10:100, 15:100) ve 6 farklı işlem süresi kullanılarak (1 dk , 10 dk, 20 dk, 30 dk, 60 dk, 120 dk) su ile ekstraksiyon işlemi gerçekleştirilmiştir. Bağımlı değişkenler olarak toplam fenolik madde miktarı, antioksidan aktivite ve renk değerleri belirlenmiştir. Toplam fenolik madde miktarı değerlerine göre optimum katı: solvent oranı ve optimum ekstraksiyon süresi sırasıyla 5:100 ve 60 dakika olarak bulunmuştur. Ek olarak L*, a*, b* ve toplam renk farkı değerleri toplam fenolik madde miktarlarıyla yüksek oranda pozitif korelasyon göstermiştir. Abbasi, H., Rezaei, K., Emamdjomeh, Z., Mousavi, S.M.E. (2008). Effect of various extraction conditions on the phenolic contents of pomegranate seed oil. Eur J Lipid Sci Technol, 110(5):435-440.Alekovski, S., Sovova, H., Curapova, B., Poposka, F. (1998). Supercritical CO2 extraction and Soxhlet extraction of grape seeds oil. Bull Chem Technol Macedonia, 17:129–134.Altan, A., Maskan, M. (2004). Gilaboru (Viburnum Opulus L.) meyvesinden hazır içecek tozu eldesi üzerine çalışmalar. Geleneksel Gıdalar Sempozyumu, 23–24 Eylül, Van, Türkiye, 18–23 s.Aydogdu, A., Sumnu, G., Sahin, S. (2018). Effects of addition of different fibers on rheological characteristics of cake batter and quality of cakes. J Food Sci Technol, 55(2):667-677.Barba, F.J., Zhu, Z., Koubaa, M., Sant'Ana, A.S., Orlien, V. (2016). Green alternative methods for the extraction of antioxidant bioactive compounds from winery wastes and by-products: A review. Trends Food Sci Technol, 49:96-109.Cacace, J.E., Mazza, G. (2003). Mass transfer process during extraction of phenolic compounds from milled berries. J Food Eng, 59: 379–389.Cam, M., Hisil, Y. (2007). Comparison of chemical characteristics of fresh and pasteurised juice of gilaburu (Viburnum opulus L.). Acta Aliment, 36:381–385.Cam, M., Hisil, Y., Kuscu, A. (2007). Organic acid, phenolic content, and antioxidant capacity of fruit flesh and seed of Viburnum opulus. Chem Nat Compd, 43(4):460-461.Cesoniene, L., Daubaras, R., Viskelis, P., Sarkinas, A. (2012). Determination of the total phenolic and anthocyanin contents and antimicrobial activity of Viburnum opulus fruit juice. Plant Foods Hum Nut, 67(3):256-261.Dahmoune, F., Boulekbache, L., Moussi, K., Aoun, O., Spigno, G., Madani, K. (2013). Valorization of Citrus limon residues for the recovery of antioxidants: evaluation and optimization of microwave and ultrasound application to solvent extraction. Ind Crops Prod, 50:77-87.Dinç, M., Aslan, D., İçyer, N.C., Çam, M. (2012). Gilaburu suyunun mikroenkapsülasyonu. Elect J Food Technol, 7(2):1-11.Galanakis, C.M. (2013). Emerging technologies for the production of nutraceuticals from agricultural by-products: a viewpoint of opportunities and challenges. Food Bioprod Process, 91(4):575-579.Ghafoor, K., Choi, Y.H., Jeon, J.Y., Jo, I.H. (2009). Optimization of ultrasound-assisted extraction of phenolic compounds, antioxidants, and anthocyanins from grape (Vitis vinifera) seeds. J Agri Food Chem, 57(11):4988-4994.Joana Gil‐Chávez, G., Villa, J. A., Fernando Ayala‐Zavala, J., Basilio Heredia, J., Sepulveda, D., Yahia, E.M., González‐Aguilar, G.A. (2013). Technologies for extraction and production of bioactive compounds to be used as nutraceuticals and food ingredients: an overview. Compr Rev Food Sci Food Saf, 12(1):5-23.Goli, A.H., Barzegar, M., Sahari, M.A. (2005). Antioxidant activity and total phenolic compounds of pistachio (Pistachia vera) hull extracts. Food Chem, 92(3):521-525.Hakkinen, S. (2000). Flavonols and fenolic acids in berries and berry products. Doctoral Thesis. Kuopio University Publications D. Medical Sciences. 90 p.Harborne, J.B. (1994). The flovonoids: advances in research since 1986. London UK, Chapmann and Hall.Heredia, F.J., Francia-Aricha, E.M., Rivas-Gonzalo, J.C., Vicario, I. M., Santos-Buelga, C. (1998). Chromatic characterization of anthocyanins from red grapes—I. pH effect. Food Chem, 63(4):491-498.Herrera, M.C., De Castro, M.L. (2005). Ultrasound-assisted extraction of phenolic compounds from strawberries prior to liquid chromatographic separation and photodiode array ultraviolet detection. J Chroma A, 1100(1):1-7.İnce, A.E., Sahin, S., Sumnu, G. (2013). Extraction of phenolic compounds from melissa using microwave and ultrasound. Turk J Agric For, 37:69-75.Ince, A. E., Sahin, S., Sumnu, G. (2014). Comparison of microwave and ultrasound-assisted extraction techniques for leaching of phenolic compounds from nettle. J Food Sci Technol, 51(10):2776-2782.Karabegovic, I.T., Stojicevic, S.S., Velickovic, D.T., Todorovic, Z.B., Nikolic, N.C., Lazic, M.L. (2014). The effect of different extraction techniques on the compositionand antioxidant activity of cherry laurel (Prunus laurocerasus) leaf and fruit extracts. Ind Crops Prod, 54:142–148.Kim, S.M., Zayas, J.F. (1989). Processing parameters of chymosin extraction by ultrasound. 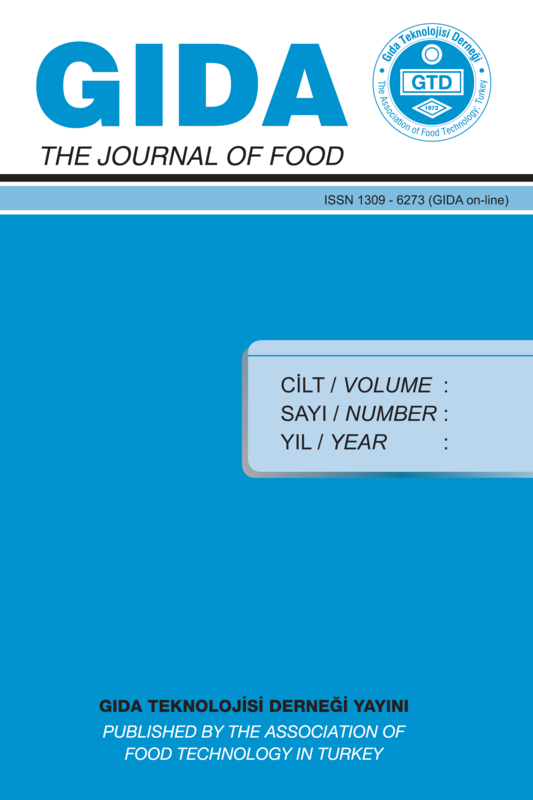 J Food Sci, 54(3):700-703.Kutlu, N., Yeşilören, G., İşci, A., Şakıyan, Ö. (2017). Konvansiyonel ekstraksiyona alternatif: yeşil teknolojiler. GIDA, 42(5):514-526.Ma, Y.Q., Chen, J.C., Liu, D.H., Ye, X.Q. (2009). Simultaneous extraction of phenolic compounds of citrus peel extracts: effect of ultrasound. Ultrason sonochem, 16(1):57-62.Moldovan, B., David, L., Chişbora, C., Cimpoiu, C. (2012). Degradation kinetics of anthocyanins from European cranberrybush (Viburnum opulus L.) fruit extracts. Effects of temperature, pH and storage solvent. Molecules, 17(10):11655-11666.Murathan, Z.,T. (2017). Farklı rakımlarda yetişen Hippohae rhamnoides L. meyvelerinin antioksidan kapasiteleri ve bazı biyoaktif özelliklerinin incelenmesi. Erzincan Üniv Fen Bilim Enst Derg, 10(2):266-277.Orakçı, E.E. (2010). Gilaburunun antioksidan aktivitesi. Erciyes Üniversitesi, Eczacılık Fakültesi, Bitirme Tezi, Kayseri.Pinelo, M., Rubilar, M., Jerez, M., Sineiro, J., Nunez, M.J. (2005). Effect of solvent, temperature, and solvent-to-solid ratio on the total phenolic content and antiradical activity of extracts from different components of grape pomace. J Agric Food Chem, 53(6):2111-2117.Rodrigues, S., Pinto, G.A. (2007). Ultrasound extraction of phenolic compounds from coconut (Cocos nucifera) shell powder. J Food Eng, 80(3):869-872.Rodrigues, S., Fernandes, F.A., de Brito, E.S., Sousa, A.D., Narain, N. (2015). Ultrasound extraction of phenolics and anthocyanins from jabuticaba peel. Ind Crops Prod, 69:400-407.Rop, O., Reznicek, V., Valsikova, M., Jurikova, T., Mlcek, J., Kramarova, D. (2010). Antioxidant properties of european cranberrybush fruit (Viburnum opulus var. edule). Molecules, 15:4467–77.Sagdic, O., Aksoy, A., Ozkan, G. (2006). Evaluation of the antibacterial and antioxidant potentials of cranberry (Gilaburu, Viburnum opulus L.) fruit extract. Acta Aliment, 35(4):487-492.Sayyar, S., Abidin, Z.Z., Yunus, R., Muhammad, A. (2009). Extraction of oil from Jatropha seeds-optimization and kinetics. Am J App Sci, 6(7), 1390.Singleton, V.L., Rossi, J.A. (1965). Colorimetry of total phenolics with phosphomolybdic-phosphotungstic acid reagents. Am J Enol Vitic, 16(3):144-158.Soylak, M., Elci, L., Saracoglu, S., Divrikli, U. (2002). Chemical analysis of fruit juice of European cranberry bush (Viburnum opulus) from Kayseri, Turkey. Asian J Chem, 14:135–138.Ulger, H., Ertekin, T., Karaca, O., Canoz, O., Nisari, M., Unur, E., Elmalı, F. (2013). Influence of gilaburu (Viburnum opulus) juice on 1, 2-dimethylhydrazine (DMH)-induced colon cancer. Toxicol Ind Health, 29(9):824–829.Upadhyay, R., Nachiappan, G., Mishra, H. N. (2015). Ultrasound-assisted extraction of flavonoids and phenolic compounds from Ocimum tenuiflorum leaves. Food Sci Biotechnol, 24(6):1951-1958.Tung, Y.T., Chang, W.C., Chen, P.S., Chang, T.C., Chang, S.T. (2011). Ultrasound‐assisted extraction of phenolic antioxidants from Acacia confusa flowers and buds. J Sep Sci, 34(7):844-851.Velioglu, Y.S., Ekici, L., Poyrazoglu, E.S. (2006). Phenolic composition of European cranberrybush (Viburnum opulus L.) berries and astringency removal of its commercial juice. Int J Food Sci Technol, 41:1011–1015.Vongsak, B., Sithisarn, P., Mangmool, S., Thongpraditchote, S., Wongkrajang, Y., Gritsanapan, W. (2013). Maximizing total phenolics, total flavonoids contents and antioxidant activity of Moringa oleifera leaf extract by the appropriate extraction method. Ind Crops Prod, 44:566–571.Wang, L., Weller, C.L. (2006). Recent advances in extraction of nutraceuticals fromplants. Trends Food Sci Technol, 17:300–312.Wrolstad, R.E., Durst, R.W., Lee, J. (2005). Tracking color and pigment changes in anthocyanin products. Trends Food Sci Technol, 16:423–428.